Crime Fiction, an enthralling crime drama, has a back-story almost as appealing as the movie itself. It’s the first effort of a remarkable group of students at the University of Chicago who, starting with grants from the University, and without any film school education, produced, directed, wrote, filmed, scored and starred in this sophisticated and multifaceted production. 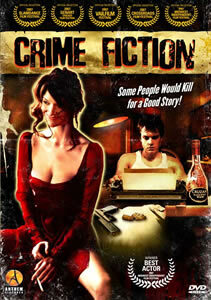 I happened across Crime Fiction when my niece introduced me to her friend, Graham Ballou, the film’s producer. I confess that as I put the DVD in its slot, I worried that I might need to invent positive things to say about it. But I was absolutely astonished by the creativity and professionalism of this film—the inventive screenplay and direction, the fine acting, the high production values, the original orchestral score and the interesting cinematography (look for the scene at the beach). Crime Fiction isa 21st century morality play. The protagonist, James Cooper (Jonathan Eliot), is an ineffectual failed novelist, whose dreary days are wasted editing copy in the basement of a Chicago textbook publisher and whose frustrating nights are exhausted staring at the blank pages of his long overdue second novel. When his agent fires him and his girlfriend, Hillary, becomes the new darling of the New York literati with her first novel, James seems destined to failure and obscurity. But a shocking event occurs. Hillary’s corpse suddenly ends up underneath his apartment window and James secretly buries her in a cornfield. Capitalizing on her “disappearance,” he takes Hillary’s advice to “write about what you know” and authors an exploitive novel about her murder—and the involvement in the crime by his main character and alter ego, also named James. With Don Lee as his role model, and to satisfy James’ publisher’s thirst for publicity, James assumes the exciting and provocative persona of his character, James. There is a skillful counterpoint between the two James—the fearful guilt-ridden author and the confident braggart of the novel. Amidst the suspense and the send-ups on the literary scene, Crime Fiction interestingly explores the questions of reality, fantasy and morality. James is doggedly pursued as a suspect in Hillary’s death by a Chicago police detective, his Porfiry Petrovich to James’ Raskolnikov. Can James’ new love, Lauren (Katrina Lenk) redeem him, as his own version of Crime and Punishment’s Sonya, or will there be a 21st century climax to the film? Jonathan Eliot (After the Harvest), who also wrote the screenplay, is outstanding in the role of James Cooper. Other excellent actors are Christian Stolte (Prison Break) as Don Lee, Steppenwolf company member Yasen Peyankov as the police detective, Katrina Lenk as Lauren (Will and Grace), and in multiple roles, Dan Bakkedahl, now a regular on The Daily Show with Jon Stewart. The Crime Fiction group is working on their second film. I can’t wait to see it.